The Basil Basimply Flower EC basket is an oval-shaped silver bicycle basket that boasts an impressive floral motif. Suitable for men and women’s bikes, it’s guaranteed to prove a hit. The Basil Basimply Flower EC bicycle basket makes an instant impression with its classic silver base and eye-catching floral pattern. Compact and practical, this bike is useful when you plan on doing a little spot of shopping or need some mobile storage to cart life’s little essentials with you. You can cart packed lunches and small accessories with ease. 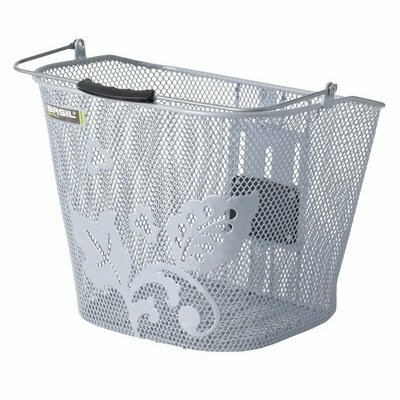 Made of hard-wearing steel, this basket has a fine-mesh construction to withstand everyday wear and tear, with an easily removable base and height adjustments for when you need to switch things up slightly. The dimensions of this bag are 34 x 25 x 27 cm, with a generous capacity ensuring you never have to compromise on cargo. The basket is easy to fix to your bike thanks to the BasEasy mounting system. Compatible with the BasEasy Stemholder EC, the Basil BasEasy Luxurious Stemholder, the BasEasy Handlebar Holder and KF Adaptor, it’s an ideal choice for those who want something more versatile. Looking to take your bike storage to the next level? This stylish basket makes the perfect choice. Browse the complete range online today at Basil and stock up on those essential accessories and attachments. Basket is height adjustable with convenient slots. Use a raincover to keep contents dry. 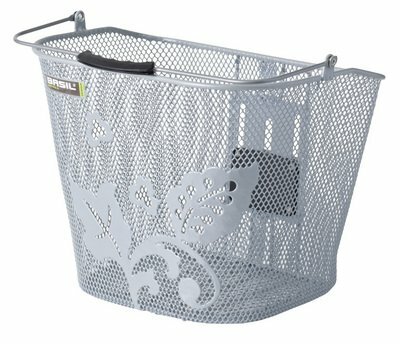 This bicycle basket easily fits all BasEasy system holders. A convenient plastic handles means you can take this basket with you, wherever you go.